Billy Dee Williams portrayed iconic scoundrel Lando Calrissian in the original Star Wars trilogy and most recently Star Wars Rebels. Now Donald Glover will play the beloved character in an upcoming Han Solo Star Wars spin-off movie directed by Phil Lord and Christopher Miller (The LEGO Movie). Glover will join Alden Ehrenreich - previously cast as the young Han Solo - in an adventure set before A New Hope. Incidentally, rumours persists Ehrenreich will first appear in Gareth Edwards' Rogue One: A Star Wars Story this December. 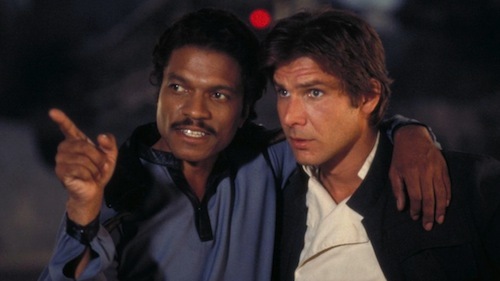 Details are scant, but fans should expect to see Solo and Calrissian in their formative years as the galaxy is plunged into turmoil with the fall of the Republic and rise of the Empire. Donald Glover appeared in The Martian, directed by Ridley Scott, and will be seen in Spider-Man: Homecoming in 2017. The untitled Han Solo movie is scheduled to be released in 2018.